"How to structure and write your doctoral thesis"
"Basics in Data Management and Statistics"
"Getting Started with the Doctorate"
My skills profile: What additional qualifications do I need - now and later? "Communication & Presentation in the Academic Context"
"Keep Smiling - Conflict Management"
The workshop provides you with a set of useful commands and gives you a first idea of how R works. Previous knowledge of R is not required. Bring your own data and ideas for plotting them. And we will show you how to produce the plots in R.
"Communication & Presentation in the Academic Context II"
Whether small talk or academic subject presentation - the ability to present oneself adequately and to communicate one's concerns effectively is a deciding factor of career related success in academia. This workshop is based on the one that took place in 2013. It is meant to prepare the doctoral researchers of the RTG for the tasks to come at the next meetings and, of course, for their future career. "Work Life Balance - A healthy equation"
The focus of this seminar is on the reconciliation of the demands of a successful scientific career with those of a satisfying family life. Balancing these demands is a problem for many scientists in our times. Mostly they suffer from an imbalance of these five areas of life: Work performance, family, health, values and finances. Fortunately, it is possible to find your individual balance. "Communication & Presentation in the Academic Context I"
Whether small talk or academic subject presentation - the ability to present oneself adequately and to communicate one's concerns effectively is a deciding factor of career related success in academia. This basic workshop is a first step to improve the presentation skills of our doctoral researchers. scientific career and gender specific communication"
Women and men communicate in quite different ways. While, for example, women want to discuss on a common level and to the point, men act vertically, trying first to gain power. During this training, the doctoral researchers of the RTG as well as some of the professors will learn a lot about these pathways of communication and, of course, reflect on their own way of expressing themselves. There will be a special focus on communication in the world of science. Dr. Modler worked for many years as an executive in media industry. His today’s work is also founded on five years of experience as labour judge. In 1998 he founded his executive coaching consultancy. 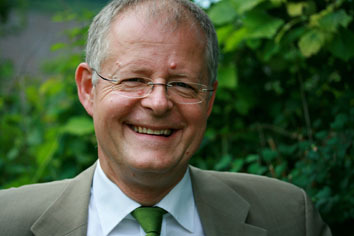 He holds teaching assignments at the universities of Freiburg i.Br. and Basel. The “Arrogance Training for Female Executives” has been developed by him.